Can the way we farm be part of the solution? Farming and weather go together. The never-ending summer of 2006, the big freeze of 2010, and widespread flooding in 2012 all had a major impact on Scottish farmers, and only one was good. But these aren’t just one-off events – the data clearly shows that our weather pattern is changing. In the last 50 years we’ve seen a 5 week increase in the growing season, a 1°C rise in average temperature and 45% more summer rainfall. That’s already a challenge for many farmers, having to take cattle off ground that’s now too wet or ending up with soil compaction after harvest. It’s much worse for farmers in developing countries, with fewer resources and poor infrastructure. Herders in Somaliland have lost half their cattle and can no longer feed their children because the water management system is no match for the interminable drought. Bijumon Kurian, fairtrade organic coffee producer from Kerala, India, was in Scotland last month describing how reduced rainfall is cutting coffee yields, making survival marginal for the 5,000 small farmers in his co-operative. But farming is not just on the receiving end of climate change: it’s also driving the process. 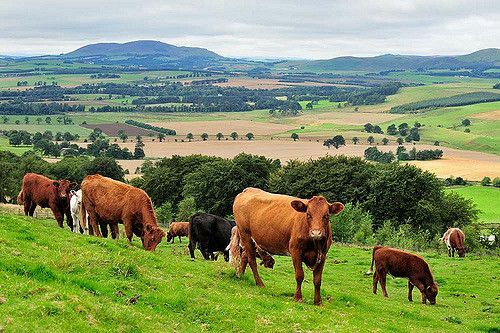 In Scotland, agriculture accounts for almost a quarter of all our greenhouse gas emissions – mostly not from those big tractors but from methane produced by cattle and sheep, and nitrous oxide from the way nitrogen interacts with the soil. Farming, therefore, has a responsibility to do its fair share towards reducing greenhouse gas emissions. 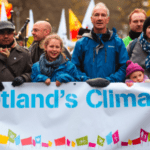 Scotland’s new Climate Change Plan calls on farming to play its part in meeting our climate targets here in Scotland – alongside all other sectors of the economy -as part of the global effort to tackle climate change. Key measures in the plan include expecting farmers to test their soil regularly and put on lime when needed. This improves the efficiency of fertiliser use, so farmers can save money and also reduce emissions of nitrous oxide, a greenhouse gas. This is, like loft insulation, a no-brainer: and while progressive farmers all do this, many farmers are still heating the sky and wasting money. The Stop Climate Chaos Coalition wants soil testing to be a compulsory measure to drive change faster, while others argue for encouragement rather than regulation. There’s a plan to look nationally at how we can use nitrogen more efficiently, as over 40% of all the nitrogen in the system escapes into the air and water. The plan also proposes more agroforestry– combining trees with pasture, and trees with crops increases overall yields as well as helping biodiversity and water management. Wider land use measures, such as restoring peatlands and increasing tree cover, are also important at a large scale to lock carbon in the soil and vegetation. Peat bogs have been damaged in the past through inappropriate use and have released centuries of safely stored carbon into the atmosphere. Scotland’s soils contain 60 times as much carbon as all the trees and plants growing on it, so managing the soil well is vital. Over decades, soil carbon levels have reduced in our arable soils and we could do more with organic and regenerative farming methods to maintain and increase the carbon stock in soils. These are just a few of the measures and ideas proposed by Government in the Plan. 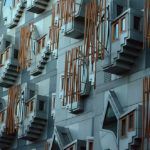 It’s all part of the government’s ambition to make Scotland a world leader in green farming – which is not just the right thing to do for the climate but key to a prosperous farming sector which depends on a reputation for quality products. We hope this is an ambition that all our farmers can get behind.